I know it's Saturday and we usually do the whole "Social Pet Saturday" thing, but it's been quite a busy week for me and I haven't been able to keep up with bookmarking blog posts. In fact, I am considering making Social Pet Saturday a bi-weekly or even monthly feature because I have to write it last minute usually. I have yet to decide on that. So, I would just like to take this opportunity to share a couple of announcements. 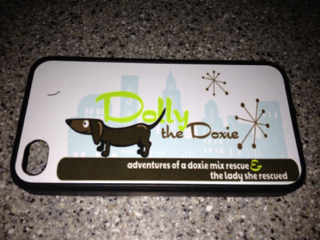 First up, I wanted to thank Miss Dolly the Doxie for being such a nice friend! I won a prize over at her blog recently. It was an iPhone cover with Dolly's cute logo on it. As much as I loved it, I asked to pass the prize along to someone else because I don't have an iPhone. Dolly's cute iPhone cover. Photo is from Dolly's blog. Well, Miss Dolly was so nice that she sent me a different prize! Something she totally didn't have to do but I think it was so super kind of her. Thanks Dolly! She sent me an ASPCA pack that contained a huge "I Love My Shelter Dog" canvas tote and lots of goodies inside. The canvas tote was perfect for our trip to Schlitterbahn on Tuesday. She also sent Shiner some VetIQ Vitamin Chews in a separate package. A couple of our goodies from Dolly. Shiner loved the Nutrish food! On another note, maybe you've noticed by now but there are a few new affiliate links over in my sidebar. 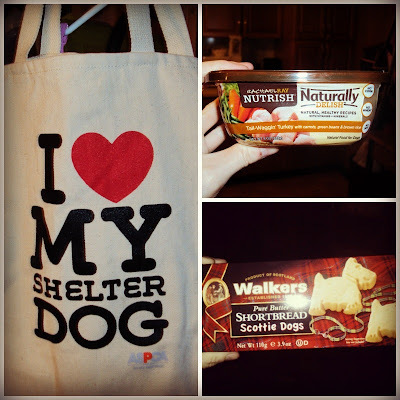 Last week, I was asked to join the Pet360 and PetFoodDirect affiliate programs and decided to give them a try. Pet360.com is a great place for pet parents to go and shop, get advice about their pets, and connect with other like-minded pet people. I just created a profile on their website for both Shiner and Honey Delite. I didn't see an option for pet rats, so Nibblet is left out this time. Joining the Pet360 community is pretty simple and I hope to get some good ideas over there. You can join too by following this link -Join the new place for Pet Parents - tailored for you and your pet - at Pet360.com! PetFoodDirect has tons of pet products available. Food, toys, medications... You can also sign up for auto shipping on your pet's food and save some money that way. They offer free shipping on orders of $49 or more and 60 lbs. or less. Right now you can Save up to 50% during PetFoodDirect.com's Summer Sale. So if you ever feel like doing a little shopping for your pets, consider using our affiliate links here. I will try to add some nice deals to the sidebars every now and then. I do make a percentage of money from the sales that go through our affiliate links, which helps support our blogging efforts. This blog post does contain affiliate links also, just FYI. And finally, Shiner has a request from her friends. 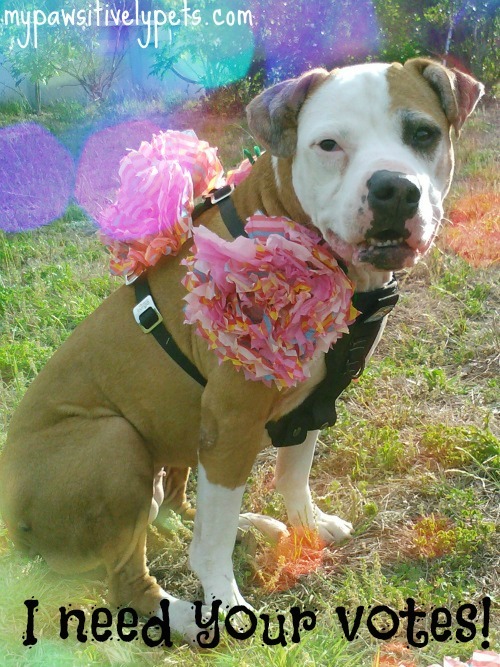 She's in the Snouts In The City photo contest and would love a vote from her pals. All you have to do is visit the contest by clicking here and leave a comment and/or share her picture via social media. Each comment and share is worth a vote. I also see a few other friends in the contest that you should vote for too. Be sure to stop by and vote for Misaki and vote for Molly too! We commented. Dolly is very nice to have sent you that nice package. Enjoy! Those Scottie shortbreads are cute! That was so nice of Dolly to send you a different goodie!!! That was very very nice of Dolly to send you a substitute prize. Hope you win that contest that shiner is in. Take care. Sure Dolly - and thanks again! I've tried the Amazon affiliate program without tons of luck. Although, I've noticed I've done a little better with it as time progressed. I think it takes a certain type of skill that I may not have mastered yet lol. Oooh, nice stuff from Dolly! And we commented and tweeted for Shiner! Shiner! We LOOOVE (okay *ALLIE* loves) your PINK flowers!! Got my vote in. Best of luck! Thank you guys! We appreciate it! Gotta go vote for Shiner. Glad you had a good time on vacation. Don't slack off on the Social Saturdays. MOL! Pet people are the best! That's a cute bag :) Congrats for the prizes. Love the tote bag! I need to find myself one similar to that. Wow what alot of wonderful gifts you recieved there! The tote bag is awesome! I will vote for Shiner right now, and share the link through facebook! Good luck!! Wishing us both luck in the Snouts contest!